An alliance of the most influential global institutions, including the UN, World Bank, IMF and OECD, just issued a report of the Global Commission on the Economy and Climate, chaired by Felipe Calderón and Nicholas Stern. 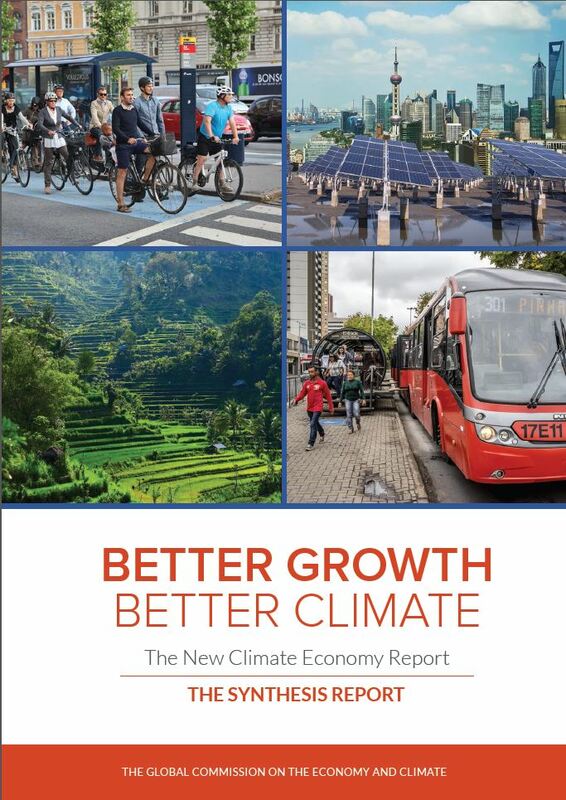 The report’s title is Better Growth, Better Climate: The New Climate Economy. In a nutshell, it says that not only is climate action compatible with economic growth, but the two may actually work as a positive feedback loop: more climate action leading to more growth, “smart” growth-spurring policies reducing emissions of greenhouse gases. By and large, the report does not contain any new arguments, as it is more of a synthesis of existing research. Alas, it is a synthesis of only a part of existing research, which can be already seen in the title: economic growth is a main objective along with the mitigation of climate change. You’ll vainly look for any reference to the degrowth and a-growth debates, and so the report, while valuable in some respects, reproduces many of the common errors of growth-enthusiasts. Some people argue that action to tackle climate change will inevitably damage economic growth, so societies have to choose: grow and accept rising climate risk, or reduce climate risk but accept economic stagnation and continued under-development. This report seeks to understand how countries with different kinds of economies can meet the goals of stronger economic growth and development while also reducing the risks of dangerous climate change. […] Can they overcome current economic problems and establish new models of growth [why not just “new models of the economy”? – ZG]? First of all, the most basic problem of most “green growth” arguments is that it is not obvious that the envisioned policies would really trigger growth. A primary example is the call for more efficiency on the demand side, e.g., in terms of food wastage or increased longevity of products. Clearly, the best low-carbon product is the one never produced and consumed. But how are we to achieve long-term growth if we deliberately reduce demand for new products? Also typically for such “green growth” arguments, the Commission unduly generalises small-scale stories of success which likely wouldn’t work if made the “new normal”. For instance, it presents examples of successful green policies that boosted growth in some cities (such as Portland). But they seem not to recognise that this is a zero-sum game: investments in good public infrastructure, which sometimes also happen to be good for the environment, attract private investments – which, however, lack in other, less-green cities. If all cities would engage in such policies, the aggregate growth effect would likely be close to nil. Similarly, the Commission invokes the examples of successful European countries such as Sweden which are growing without being overly destructive in terms of environmental impact. However, these are countries which, first, are mostly sparsely populated, which helps a lot to restrict negative environmental impacts, and second, are well-integrated with global markets, thus being able to “outsource” dirty but essential industries to China, India and other developing countries. We cannot all “dematerialise” our economies and grow only on Google and Facebook (which are themselves quite energy intensive, by the way). And the hoped-for increases in resource efficiency, which would indeed make growth possible without an accompanying increase in environmental impact, is of very limited potential for long-term growth. Thermodynamic laws prevent infinite increases in resource efficiency. The Commission apparently ignores all negative impacts of low-carbon technologies. There is no mention of the huge environmental costs of a low-carbon transition (with the need to replace huge amounts of infrastructure); the problems specifically related to renewable energies, which exhibit low energy density and thus high space requirements; the problematic side-effects of low-carbon technologies in terms of non-energy related environmental pressures (e.g., the increased demand for rare earths). Rebound effects are mentioned once in the synthesis report, in a rather casual and downplaying manner. Green jobs are invoked, without any reflection of the connection between labour-intensive low-carbon technologies, changes in productivity, and employment. Their vision of a “climate-smart” agriculture is pure wishful thinking, with more productivity, less material input and less environmental impact. In summary, you can find some good ideas for a better climate policy in the Commission’s report. However, it would be much better if they refused the temptation to include better growth as an overarching goal. The self-pronounced “new climate economy” is not much more than just a replica of a bunch of flawed decoupling ideas.